Robert Peston, What the Flip! 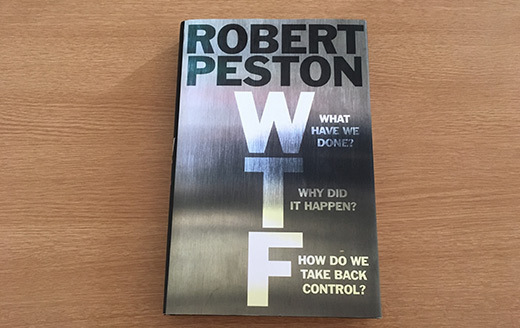 I have just read the unfortunately titled ‘WTF’ by Robert Peston. I had previously enjoyed ‘Who runs Britain’ by the same author, and whilst his voice is a little irritating, reading his prose avoids this. The Trinity blog is not the place for the expression of political views, and in fairness to Peston, his condemnation is pretty evenly balanced but if you ever have asked the question of how we ended up with Brexit, Trump and Corbyn, this is a good place to start. A lot of the blame is put on Social media, and it is somewhat prophetic in its mentioning of Cambridge Analytica considering the book was published in 2017. So whilst algorithms will narrow our views if social media becomes our main source of income, a book such as WTF is a worthwhile read even if it is just to see an alternative viewpoint to a solution to the problems we face. I believe that is healthy and also why I will happily place it on my bookshelf next to such books as ‘The establishment and how they get away with it’ by Owen Jones and ‘How did we get into this mess?’ by George Monbiot. There’s a joy in reading books, and although I would not profess to have the right opinions about all subjects, I do want a balanced view, and that can sometimes mean reading books which I don’t necessarily agree with. Peston’s book is full of interesting facts and anecdotes, he’s also surprisingly disarming, and admits that from his comfortable Islington background, he hadn’t realised the disconnect many in other parts of the country were feeling with the London middle classes. This book is current and topical. It will get you thinking, it will evoke discussion, I would love to know what you thought of it. Trinity Wealth Management Limited is an appointed representative of ValidPath Ltd which is authorised and regulated by the Financial Conduct Authority under the Firm reference no. 197107. Trinity Wealth Management’s FCA number is 206188.